Interested in the new active adult community called Imagery in Mount Holly, NC? Here’s a summary of the neighborhood. And please call us if we can help answer more questions about this neighborhood! The community will include 480 homes and 300 acres on peninsula across the lake from Latta Plantation Nature Preserve. Beautiful homes and views, incredible amenities, and an active, yet carefree lifestyle, can all be found at Imagery. Interested in building a new home at Imagery, or wondering what it’s like to live here? Please contact us! We’d love to answer your questions! Imagery is a new active adult community built on 300 acres of land formerly owned by an influential Charlotte couple – Andreas and Regine Bechtler. The Bechtlers had a passion for promoting art in the community, and are well known as the founders of the Bechtler Museum of Modern Art in Uptown Charlotte. Inspired by this artistic history, and it’s location on Mountain Island Lake, the community emphasizes “artful lake living.” For lake lovers, boat slips and storage for kayaks and canoes are available. Visit the private community beach, or swim in the infinity pool that overlooks the lake. You can also build your new home on the lake, as limited lake lots are available. Love the arts? There are activity cabins that offer facilities for ceramics, painting and sewing. Or get inspired for your art by enjoying the beautiful lake views and pocket parks throughout Imagery. The amenities at Imagery go beyond the arts and the lake, and include a fitness center, clubhouse, tennis and pickleball courts, and a community library and game hall. Wherever your active lifestyle leads, you can find it at Imagery. Lennar Charlotte offers three communities in Imagery with single family homes that include two to four bedrooms and up to 4,000 square feet. 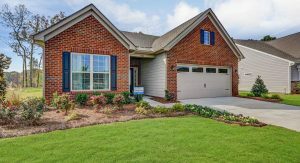 The Grove community offers homes that range in size from 1,436 square feet to 2,429 square feet and are priced from $295,000 to $334,000. Floor plans in this community include two to three bedrooms and two to three full baths. The homes in the Meadows community range from 1,816 square feet to 2,973 square feet and are priced from $346,000 to $402,000. Floor plans in this community feature two to four bedrooms and two to three and a half baths. The Pinnacle community offers homes that range in size from 2,132 square feet to 3,292 square feet, and are priced between $404,000 and $461,000. Lakefront lots and quick move-in homes are available. If you’re interested in this community, please contact us! We’d love to share our insights into the floor plans, lots and lifestyle. The welcome center for the neighborhood is located at 715 Horseshoe Bend Beach Rd., Mount Holly, NC 28120.